Call it the need to make a position higher up in the food chain or getting influenced by the influential, KTM RC8R is going the Bajaj way. Bajaj has long been the only Indian motorcycle manufacturer to have Twin Spark Plugs per cylinder (well Bajaj bikes are only single cylinder till date), till Royal Enfield Bullet decided to brake the monopoly. 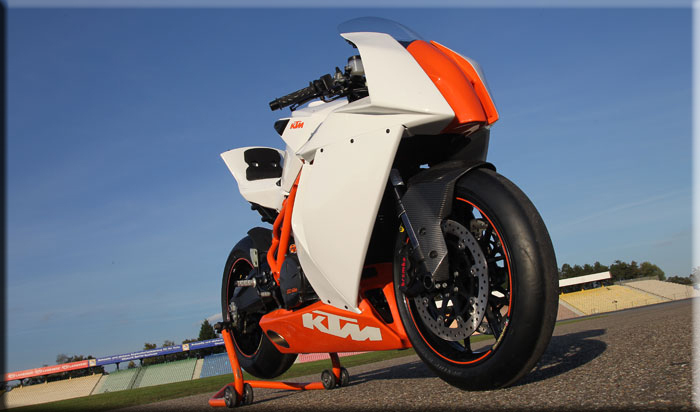 So, what does this have to do with KTM RC8R? Well, the KTM RC8R, even though a gorgeous European, really never made it to join the top league due to performance issues. It was high time that KTM decided to change the tide for the year 2011. The previous versions of RC8R didn't get much buzz because it had issues of fueling which caused abrupt throttle response. So, heeding to the feedback, KTM decided to do multiple changes on the 2011 RC8R other than going for the twin spark plug per cylinder. 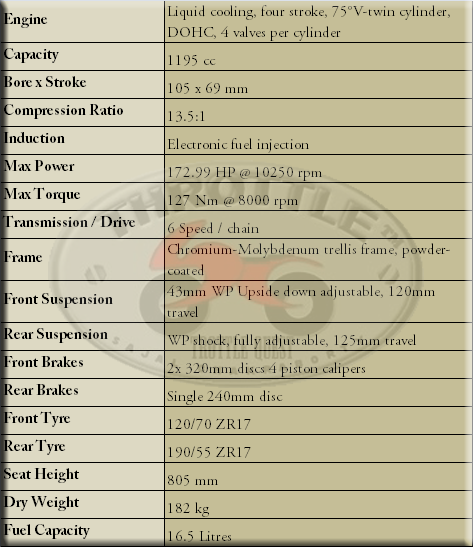 Along with the twin spark plugs, the 2011 KTM RC8R has gone for a new camshaft ,refined fuel injection and a heavier flywheel (meaning better engine braking), which have collaborated in a power bump to 172.99 hp @ 10250 rpm from a previous of 168 hp and the torque has increased to 127 Nm @ 8000 rpm from a previous of 125 Nm. But apart from the power and the torque bumps, the biggest change that these changes has brought to the bike is it's response. 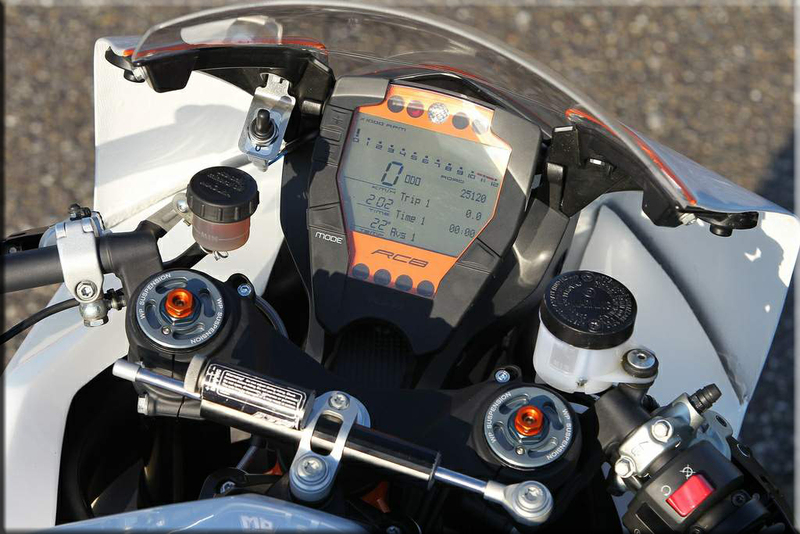 The power delivery has become a lot more smoother and the throttle response has also become crispier. Even though fuel economy hardly matters in these bikes, but it's being claimed that the changes, specially the inclusion of the twin spark plugs, which intend to burn fuel more efficiently and provide better cam timings, has resulted in improved fuel efficiency for the bike (now see, why I said that it might be a case of getting influenced by the influential... Bajaj had the same idea behind the introduction of the DTSi engine on Pulsars, better fuel efficiency and better throttle response). KTM claims that they have thoroughly revised the suspension settings giving it a wider range of adjustability, which includes a new eccentric linkage for the rear shock. Look wise well, KTMs always look class apart and radical. 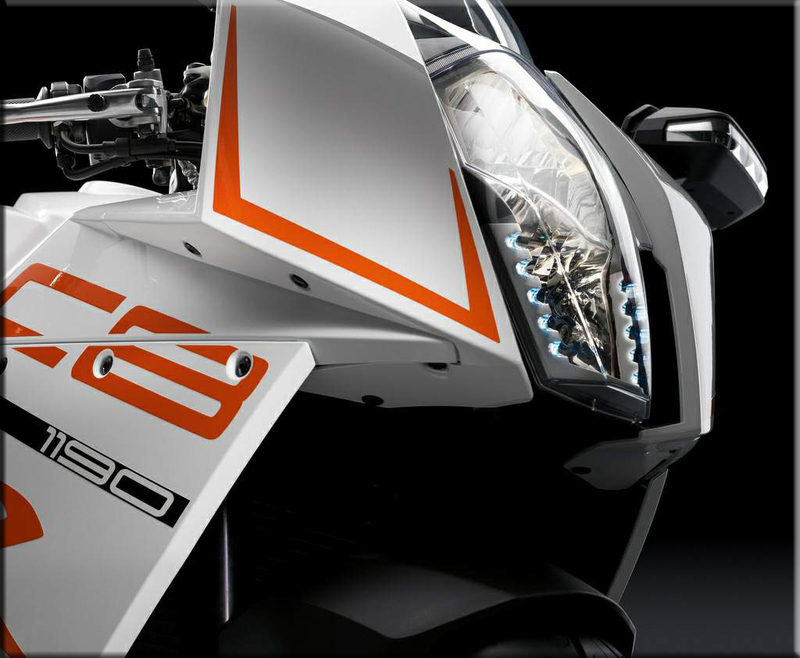 LED running lights, two tone and loud color scheme perfectly accent KTM's sharp geometric lines. Apart from the street version, KTM has also launched the track version of the 1190 RC8R. Looks like KTM is trying to cover corners as much as possible. With 2011 Aprilia RSV4 Factory APRC SE and the all new green bad boy Kawasaki Ninja ZX10R in the scene for the next year, it would be very interesting to see how KTM fairs up in the 2011 liter class smack down. my dealer is discounting the 2010 RC8R but I think I'll hold out and go for the 2011 model. I have it....I love it....I am 6'2" tall and 215 pounds....very comfortable given the ease of changing peg and bar height. She is very smooth and imperceptibly fast. Nice bark from the exhaust without being over the top. Freeway riding yields 42-44 mpg. I need to work on suspension settings but there is a wide range to work with. I love the bike. I own a 2005 R1, and I have owned a 2007 BMW R1200s, and a 2001 Yamaha FZ1 in recent years. Well man that's a HUGE stable you have there mate!! It's amazing to hear such reviews. Naw.....I have the RC8 for street riding and the R1 for the track. That's it. I have just owned the others and more in the past. Thanks.